[130 Pages Report] Ethylene Tetrafluoroethylene (ETFE) market was valued at USD 327.7 million in 2017 and is projected to reach USD 518.4 million by 2023, at a CAGR of 8.0% during the forecast period. The base year considered for this study is 2017 and the forecast period is from 2018 to 2023. Both, the top-down and bottom-up approaches were used to estimate and validate the size of the ETFE market and to estimate the size of various other dependent submarkets. The research study involved extensive use of secondary sources, directories, and databases such as Hoovers, Bloomberg, Chemical Weekly, Factiva, the Independent Chemical Information Service (ICIS), and the Securities and Exchange Commission (SEC), among various government and private websites to identify and collect information useful for a technical, market-oriented, and commercial study of the ETFE market. 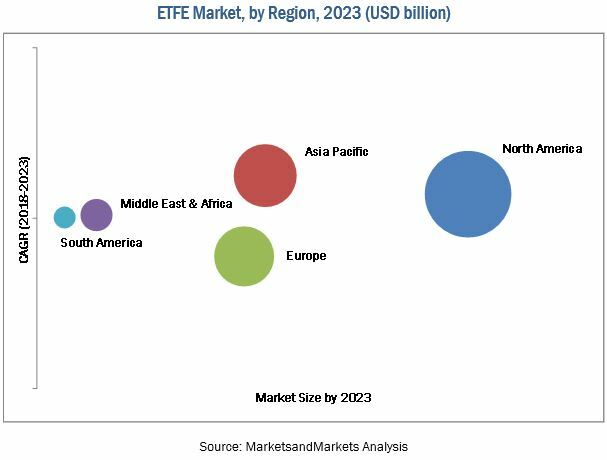 The ETFE market has a diversified and established ecosystem of upstream players such as raw material suppliers and downstream stakeholders such as manufacturers and vendors of ethylene tetrafluoroethylene, end users, and government organizations. The key players in the ETFE market include Asahi Glass Company (Japan), Daikin Industries (Japan), The Chemours Company (US), 3M (US), Quadrant (Switzerland), Guangzhou LiChang Fluoroplastics (China), Hubei Everflon Polymer (China), Ensinger (Germany), and Vector Foiltec (Germany). The ETFE market is covered in detail in this report. The current market demand and forecasts are also included in this report to provide a comprehensive market scenario. ETFE is a lightweight material that can be recycled into useable ETFE products. It is 100% recyclable and requires less fabrication than traditional building materials, reducing C02 emission. ETFE performs many functions of glass often with greater efficiency. The lifespan of glass is around 10 to 20 years while that of ETFE is around 30 to 50 years, without significant degradation. Being 100% recyclable and requiring minimal energy for transportation and installation, ETFE makes a significant contribution to the green construction. ETFE is used in many applications such as wires & cables in automotive, industrial, aerospace, transit, and appliance industries. It is also used in films and sheets, tubing and pipes, electronic components, electrostatic and rotomolded vessel linings, valves, fittings, and pump housings. ETFE coatings are particularly well-suited for the semiconductor and pharmaceutical industries. ETFE is used in buildings as a two or three layered air-filled cushion or as a single layer cable-supported structure. Building & construction, automotive, aerospace, nuclear, and coating industries use ETFE for various applications. Another key use of ETFE is for covering electrical and fiber-optic wiring used in high-stress, low-fume-toxicity, and high-reliability situations for instance in aircraft and spacecraft wiring. Some small cross-sectional wires such as the wires used for the wire-wrap technique is coated with ETFE. ETFE allows more sound transmission as compared to other materials such as glass and other plastics. This factor is majorly restraining the ETFE market growth. ETFE pillows transmit almost all sounds from outside. However, noise and rain suppression systems are now being incorporated into external structures with successful results. For a roof subject to raindrops, the sound of rain can be suppressed by adding a rain attenuation layer on the surface of the cushions. This acts as a dampener, stopping the sound reverberating around the space below. Adding additional layers to the surface will, however, increase the cost of the construction. Despite its strength, ETFE can be cut through with a sharp knife. Owing to this limitation, ETFE is generally not used in windows or on exterior walls unless a foundation of roughly 15 ft. is created off the ground. ETFE foil can be punctured with a knife or other sharp implements, which acts as a restraint for the ETFE market. The increasing use of Ethylene Tetrafluoroethylene (ETFE) in various applications in different end-use industries is driving the growth of the ETFE market across the globe. The ETFE market is projected to grow from USD 352.4 million in 2018 to USD 518.4 million by 2023, at a CAGR of 8.0% between 2018 and 2023. The eco-friendly and recyclable properties of ethylene tetrafluoroethylene, increased demand for ethylene tetrafluoroethylene from various end-use industries, and better properties offered by ethylene tetrafluoroethylene than glass and other conventional fluoropolymers are driving the growth of the ETFE market across the globe. Among types, the pellet/granule segment accounted for the largest share of the ETFE market in 2017, in terms of both, volume and value. Ethylene tetrafluoroethylene granules are widely used in the acid-resistant and alkali-resistant injection products, electric wires & cables, valve lining, and spray painting. Ethylene tetrafluoroethylene in granular form is extruded into films & sheets and wires & cables, which are then used by various end-use industries such as architecture, automotive, aerospace, and chemical processing. 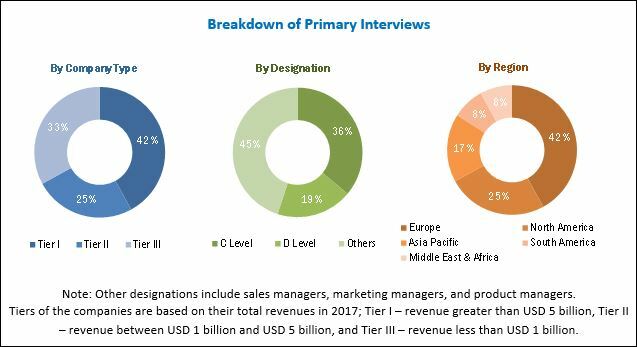 The injection technology segment of the ETFE market is projected to grow at the highest CAGR between 2018 and 2023, in terms of both, volume and value. Ethylene tetrafluoroethylene resins can be processed at a wide range of temperatures due to their improved thermal stability and low melting points using the conventional injection molding techniques. Ethylene tetrafluoroethylene resins are also resistant to ultraviolet rays, making them suitable for outdoor applications. Among applications, the films & sheets segment of the ETFE market accounted for the largest share of the ETFE market in 2017, in terms of both, volume and value. Presently, ethylene tetrafluoroethylene films & sheets are largely replacing glass in the building & construction industry due to their excellent light transmission properties. Ethylene tetrafluoroethylene sheets are assembled into cushions that are inflated for structural applications. These cushions provide thermal insulation with reduced initial costs and lesser structural support as compared to conventional glazed roofs. The North American region is the largest consumer of ethylene tetrafluoroethylene across the globe. The growth of the North America ETFE market can be attributed to the increased demand for ethylene tetrafluoroethylene from various end-use industries of the region. The Asia Pacific ETFE market is projected to grow at the highest CAGR during the forecast period, in terms of both, volume and value. The growth of the market in the Asia Pacific region is due to the easy availability of cheap labor and raw materials in the region. Moreover, the growing economy of countries such as China, Indonesia, Taiwan, and India is also attracting new foreign investments in these countries, thereby leading to the growth of various end-use industries in the Asia Pacific region. In addition, the formulation and implementation of various policies mandating the use of environment-friendly products have led to innovations in the ethylene tetrafluoroethylene industry of the region. However, high capital investments and requirement of a qualified workforce for carrying out operations related to ethylene tetrafluoroethylene are expected to restrain the growth of the ETFE market in the Asia Pacific region. Asahi Glass Company (Japan), Daikin Industries (Japan), The Chemours Company (US), 3M (US), Quadrant (Switzerland), Guangzhou LiChang Fluoroplastics (China), Hubei Everflon Polymer (China), Ensinger (Germany), and Vector Foiltec (Germany), among others are the key players operating in the ETFE market. ETFE is being used in the architecture industry over the last 25 years. The architecture and construction sectors have experienced a revolution with the use of this material. ETFE helps in building artistic structures and in energy savings. In the case of ETFE cushions, they are kept continually pressurized by a small inflation unit which maintains the pressure at approx. 220 Pa and gives the foil structural stability and the roof some insulation properties. As ETFE is transparent, self-cleaning, durable, and flexible to a great extent, it is emerging as one of the most popular materials in the building and design industries. The excellent properties of ETFE have made it a suitable material for many architectural projects of almost any shape. ETFE was used to construct artistic structures such as China’s Shenzhen East Huaqiao City Indoor Water Park, which is one of the largest ETFE projects in China, contributing to the popularity of ETFE structures in China. ETFE structures are increasingly being used because of their transparency. It is, however, difficult to realize sufficient sound insulation for these structures, and also to predict the insulation and the sound intensity levels due to rain and other noise. For instance, Nottingham High School for Boys was built using ETFE. In order to mitigate the problem of noise at Nottingham High School, architects fitted a sound suppression system (a layer that acts as a dampener to soften the sound of the droplets hitting the tensioned cushion surface) to reduce noise levels during heavy rainfall. However, the problem was not resolved. Installation of large pieces of ETFE material requires a great deal of precision. Pneumatically pre-stressed ETFE systems obtain their integrity from an air inflation system. This system requires routine maintenance and service. The air has to be filtered in some way so as not to put excess moisture or debris into the system. Even single-layer systems require great coordination of details, as the exact amount of ETFE stretch has to be considered along with the loads it is designed to withstand. The world’s largest façade made of single layer ETFE film in Mexican first division club, FC Puebla has been renovated using 3M's Dyneon ETFE. The façade is made of more than 30,000 square meters of film and rises to a height of around 40 meters. The company was chosen for the roof renovation at London’s Tottenham Hale bus station in 2014, in order to ensure the station is fit for purpose for decades to come. The bus station roof was covered with around 860 square meters of Dyneon ETFE highly transparent film. The company Fluon ETFE LH-8000 which exhibits advanced adhesive properties that allow it to bond to dissimilar materials, such as polyamides, polyethylenes and metals. It is an ultra-low-melting resin that is cost-effective for applications such as chemical bags, hot water hoses, rubber hose mandrels, anti-stick conveyor belts, multilayer monofilament, interlayer insulation film for electronic substrates and tubes that convey harsh materials in the chemical, plastics, oil and gas, building and paint industries. The company launched new ETFE resins, Fluon adhesive ETFEs which caters to the automotive components such as liquid and vapor fuel lines, compressor hoses, fuel tanks and filler necks and exhibit excellent performance in any construction. 11.6 Guangzhou Lichang Fluoroplastics Co. Ltd.
11.7 Hubei Everflon Polymer Co. Ltd.